Scott Sterzer commutes 19 miles to work each day. It’s hard to believe that this month’s column marks the beginning of the 9th year that the Commuter Column has been a regular part of Cycling Utah. This column is the longest running and perhaps the only monthly bicycle commuter column in the United States. With that in mind, I would like to introduce the next commuter profile. Fifty-four year-old Scott Sterzer has eased into bike commuting and realized it is the right thing for him. He has improved his health, helped his wife get into cycling, gained some credible respect at the office, and has found another way to enjoy cycling. Here is what he has to say. Cycling Utah: How did decision to bike commute begin? 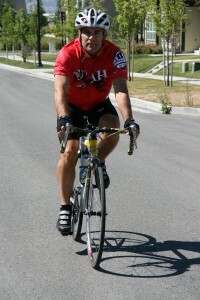 Scott Sterzer: I started cycling in 2003 and have been a somewhat avid cyclist ever since. I've always set a goal to train throughout the winter, but have never been able to achieve that goal. And then last year I bought a sports car that doesn't do too well in the snow. I have utilized mass transit for about 5 years, but had always driven my car to the bus stop. I really didn't want to leave my new car parked on the street all winter, so I started riding my bike to the bus stop. Then I figured I might as well just ride in rather than take the bus. I commute the 19 miles to work each day and then ride to and from the TRAX station to get home. C.U. : Scott, I realize your children are adults now, but what is the impact of family on your ability (or others with family) to commute to work? S.S.: I would say that the primary impact that family has on commuting and vice versa is there are a million reasons to skip the commute because there is a soccer game, birthday party or whatever. Maintaining a consistent schedule has been the biggest challenge for me. I have found that if I commute in the mornings and take the train home in the evenings that I can avoid most conflicts, still get my ride in, and be there for my family. Obviously, it is more challenging for a person that needs to get their children off to school. My family really didn't factor into the decision to start riding earlier in my life. Friends at work encouraged me to get a bike and ride with them from Rose Park to the Great Salt Lake Marina and back after work one day. I hadn't ridden in years, but thought it sounded fun so I got a cheap-o bike and started riding. However, having a family can certainly impact the ability to commute on a bike especially with younger children that are involved in so many activities. Because cycling can take a fair amount of time, you have to find a schedule that allows you to ride without having a negative impact on the family. Having a supportive spouse is pretty key as well. My wife is just getting into cycling. We got her a Cannondale cyclo-cross bike last year. She isn't very comfortable riding on the roads with traffic yet, so we enjoy riding around the lake in our community at Daybreak. She does worry about me on the roads, but is very supportive of my riding. I rarely ask for a bail-out ride, but when the snow or rain starts coming down pretty hard or we are in a hurry to go someplace, she will pick me up along the way. This can be challenging for her as she works full time as an office manager at a local doctor's office. I really try to avoid quitting part way through a ride as I was raised in the “No pain-no gain” era. Actually, cycling has made her life easier when it comes to gift buying. There is always something that I want/need for cycling and since I'm fairly particular about what I want, I generally do most of my own gift shopping. It works out well for both of us. C.U. : What about the perception of “safety”. Does that play a role in your commuting? S.S.: Safety on the roads is always a major concern. I've always felt very comfortable riding on the city streets, but my wife has always worried about my safety. She seems to hear about every cyclist that has a run in with a car. I have had a few very close calls over the years and have learned several tricks that have seemed to really help. I have several very bright jackets that practically glow in the dark. In the winter months, it is critical to have a very bright light. I have a couple of 600-lumen lights that motorists can't help but see. That made a huge difference. I also ride as close as I can to the ‘car' lane (I use the term loosely as we have every right to ride in that lane) so that motorists have a better chance of seeing me rather than being tucked as close to the curb as possible. Motorists just aren't looking for cyclists and you have to be seen to be safe. And finally, you really have to find a good bike route where the traffic isn't too heavy, there aren't a lot of side streets, and the bike lanes or shoulders have reasonable space. That isn't always easy to do. I think that one main reason people don't commute on their bikes is they are concerned about their safety. Commuting throughout the winter is especially challenging due to the slick roads. I can't count how many times people have called me ‘crazy' for riding in the winter. That is probably due to the temperature, but icy roads can always be an issue. I would generally ride my road bike as long as the temperature was above 15 degrees and the roads weren't wet or icy. There were a few days last winter where I was forced into the lane in some places because there was snow in the bike lane. On days when there was just too much snow or the roads appeared to be icy, I would have to ride my mountain bike to the train station and forego the full commute. Lucky for me last year was a very mild winter and I was able to ride most days. I was able to ride 50 days from November 1st through the end of February. Not too bad considering I took over 2 weeks of vacation during that period. C.U. : People in an office can drive me crazy with their talk of “how crazy it is to ride your bike to work”. You received those same comments. Do statements like that influence how much you bike commute? How do you respond to negative comments about your bike commuting? There are a lot of cyclists where I work. We have large bike racks that can accommodate 50 to 75 bikes and, thankfully, we have showers. No way I could ride 20 miles in the cold without a nice hot shower at the end! I mostly ride alone each day, but I do enjoy having someone to ride with. Not many of my co-workers like to leave home at 6:30 in the morning, which is when I generally leave, but it is quite nice to have some conversation along the way. A companion can also get you out riding on a day when you don't quite feel up to it as you have committed to meet them at a certain place and time. This is especially true when the temps are in the teens. C.U. : I heard you lost 20 pounds and improved your health from cycle commuting! S.S.: I ride for several reasons including my health. I really like to eat what tastes good to me, you know? Sometimes a nice Crown Burger and fries just really hits the spot. Riding regularly allows me to pretty much eat what I want and still maintain my weight. I did lose 20 pounds last year and that was really from the cycling. Well…cycling and switching from eating a Dunford's chocolate cake donut every morning to yogurt and granola. Also, I struggle with border-line high blood pressure and cholesterol. Regular cycling has really helped in those areas. At the fitness fair last year, they told me everything was great. They didn't bag on me about changing my diet and exercising more because all my levels had dropped into the acceptable range. That is the first time that has ever happened and I have to say it was really nice. It was great to be riding in March and April and not feel like I had lost all the progress that I had gained riding last year. I have always planned to ride on my trainer or hit the gym regularly in order to maintain my leg strength throughout the winter months, but I've never been able to do it. By continuing to ride all winter, I have hit spring in better shape than I ever been in. I'm riding several miles an hour faster now than I've ever been able to do before and I still have all summer and fall to improve. It has been a fantastic change from my previous early-season fitness levels. C.U. : What is your commute route? How do you incorporate the light rail and bus system? S.S.: I live in Daybreak and work at the Gateway, downtown. I ride along 4000 West and drop down to 3200 West along Old Bingham Highway. This allows me to pass over Bangerter Highway, thus avoiding a potentially dangerous intersection. I stay on 3200 West all the way to 2100 South. From there I go to 2700 West staying on that road until it ends at 900 South. Then I go straight east into town. Most of this route doesn't have too much traffic, not a tremendous amount of traffic lights, and fairly good-sized bike lanes. The industrial sections aren't very scenic, but you stay pretty safe. The other route I've taken into town is a bit more challenging to describe. I make my way down to 1300 West and then go north to around 4800 South. Then I wind my way to 300 West and eventually West Temple. There are a lot more traffic lights and it is harder to maintain a good speed in order to stay on streets with less traffic. I would suggest that prior to riding for the first time, your readers should drive the route first with an eye towards bike lanes, debris, cars parked in the bike lanes, etc. They should also talk to others that ride. Often times other cyclists can suggest good routes. Salt Lake City has a nice bike route map, but it doesn't extend out beyond the city's borders. I've not heard of any other cities that do this, but it would be very nice if they did. Public transportation works out fairly well. There are more people riding bikes every day and the bike storage on buses and on TRAX is quite limited. Unfortunately, mass transportation isn't geared towards the cyclist. However, it can be really handy when the weather turns unexpectedly bad or you have a mechanical that can't easily be fixed. And then there are times when you are just too tired to ride and need a break. With buses, bike storage can vary from 2 to 6 bikes. On TRAX, you are supposed to only have two bikes in a single area and you are supposed to stay with your bike. This means that you stand the entire ride holding your bike in most cases. I ride TRAX and try to get to the section where there aren’t any seats and bungee my bike to the rail. If I'm really lucky, there might even be an available seat nearby. Most days I end up standing. C.U. : Do you ride differently as a commuter than say as a recreational cyclist? S.S.: Now that I'm a more serious commuter, I try to follow the rules of the road better. I also wave a thank you to vehicles that yield the right-of-way to me as a way to lessen the animosity that seems to exist between cyclists and drivers. When I was more of a recreational cyclist, I rode at a leisurely pace and rode mainly on sidewalks. Back then I had no idea that cyclists aren't allowed on (some) sidewalks and that it is actually safer in the road. There are still the occasional drivers that yell at you to “get out of the road!” and wave goodbye with a nice hand gesture, but overall I think most drivers are adapting to having cyclists on the road. Having Salt Lake City support cycling as well as they do certainly helps. Over the years, I've learned ways to remain safer and be more visible to surrounding traffic. I'm much better at hearing traffic approaching from the rear. The more you ride the more you learn to adapt and adjust to the surrounding environment. I have to say that a bike commute in the fresh air on a crisp morning sure beats sitting in rush hour traffic. Ya gotta love it! C.U. : Scott, thanks for the interview and thanks for opening the 9th year of Cycling Utah.